13 session training on DVD to help you uncover the hidden barriers that will keep your visitors from coming back. Recorded from a live seminar. Free Shipping to the USA. Download Version not yet Available. You passionately desire to reach these newcomers for Christ. You know that Jesus can make a difference in their life. Will our church ever reach new people for Christ? You’ve spent the money on advertising. You’ve designed the perfect sermon series. You’ve even motivated the congregation to invite their friends to church! You celebrate the fruit – they have come, but then the following Sunday, you discover they don’t come back. I’ve seen statistics that indicate that most churches only keep 1-2 out of every 100 first time church visitors. That’s dismal. Just to stay stable, you need to keep 3 out of every 100. In order to grow, you need to keep 5-7 or more out every 100 visitors. Do you accidentally keep your church visitors from returning? Maybe you realize that your hospitality ministry has run on auto-pilot for the last few years. It has decayed to the point where something has to be done. Inertia and inefficiency always creep in to systems, and churches are no different. Perhaps your church has accidentally created barriers to helping that first time visitor decide to return for a following Sunday. It happens when things are running on autopilot. You don’t give them a good impression, nor wow them with love and welcome. You simply hand them a bulletin, and maybe say good morning. You could spend a few thousand dollars on getting people to 100 additional people to attend your service. But if only one out of a hundred return for a second service, you’re successful marketing efforts are wasted on the lack of retention. then are you ready to receive the people who come, or will a poor welcome undermine all your advance work and prayer? A poor welcome helps your visitors decide not to return. There are many reasons your visitor might not return. A poor welcome should not be one of them. Your systems and processes for your church’s hospitality can always be improved, and decaying systems can be refreshed. Hospitality ministry is not about marketing to get visitors. Rather, it is about giving a great impression to your visitor and helping them make a decision to return and learn more about your congregation’s ministry, mission, and people. You can’t grow your church if your visitors don’t come back. 50% of the unchurched choose a church because of friendliness of its members. 45% of the churched visitors choose a church because of friendliness of its members. Are your visitors impressed enough to come back for another visit? If visitors don’t return, you can’t help them find faith in Christ. find a meaningful place to serve in the community. Every church leader wants their church to have an evangelistic impact on leading people to faith in Christ. You want newcomers seeking Christ to finally respond to a member’s personal invitation to church. You want a newcomer that finally gathers the courage to visit your church after several bad experiences years before. Perhaps you’ve seen that newcomer in your church, but they fail to return. Your church will not impact that visitors life story with the gospel if they don’t come back. You won’t see baptisms of new believers if you have these unnecessary barriers in place. Help them make that decision to come back. Hospitality to first time visitors is one critical element to growing your church. It plays a huge role in helping visitors decide to make that all important second visit. Your church can make an eternal difference in the life of your visitors, if you can help them come back on a regular basis. Every church wants their first time church visitors to come back and start connecting. Every church wants newcomers to connect and find faith, friendships, and a place to serve in the transformation of a community. 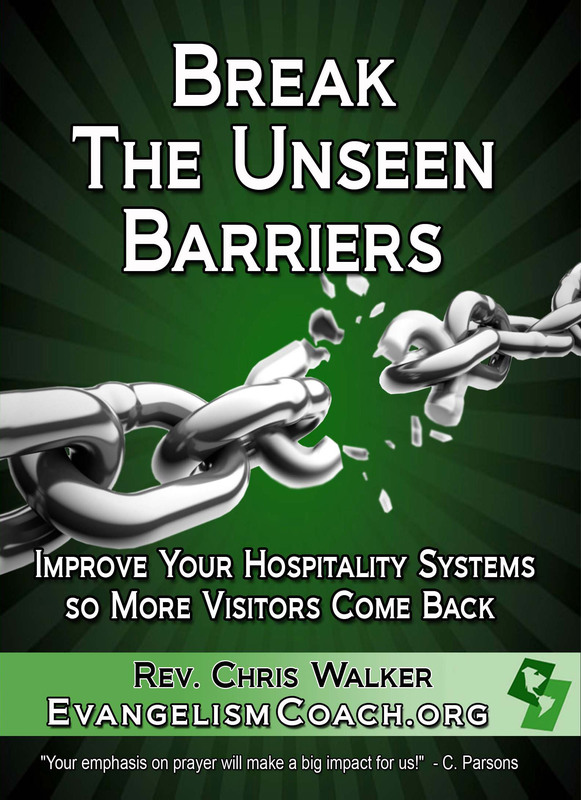 Wise church leaders will review their hospitality systems and look for unnecessary barriers that keep those church visitors from coming back. Wise church leaders will do advance hospitality preparations in expectation of new church visitors. Head of the Greeter / Ushers. Review their current facility appearance. Review their church visitor follow-up process. 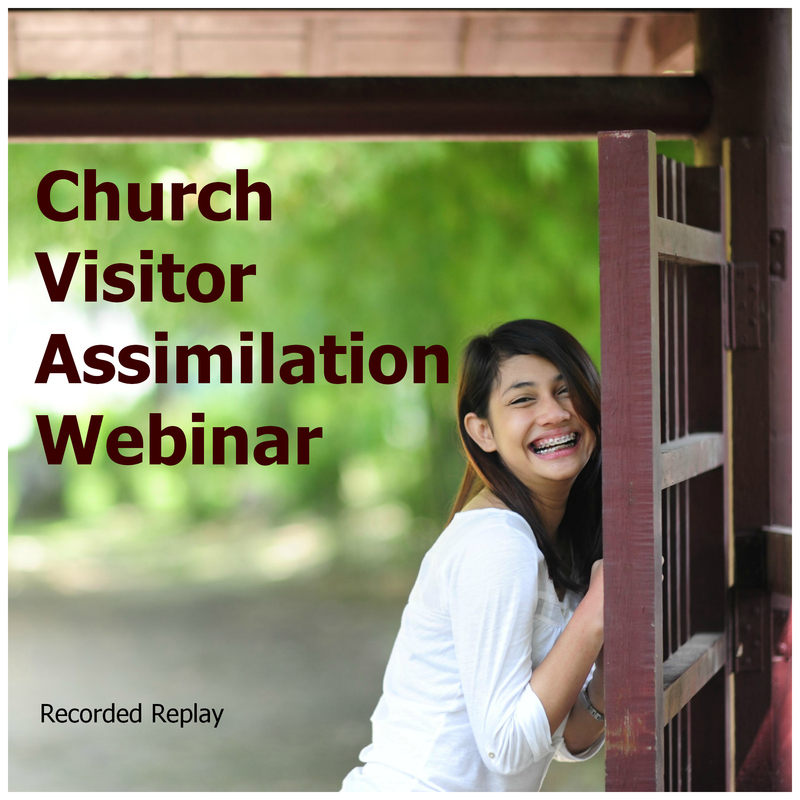 Review their process to how they get church visitor contact information. We should have . . . Think of how to improve your welcome and greeter process. By improving your welcome of church visitors, you can impress the visitor who is church shopping, whether they are Christian yet or not. You can have a worship experience that helps people encounter God. You can put some new touches on your building and grounds to help your visitors and members easily navigate your facility. Where do we start looking for those barriers? Were you recently recruited to fix your hospitality ministry? Were you appointed to fix your hospitality ministry, but don’t know where to start? When you start to think about fixing your church hospitality, we often don’t know where to start. It’s sort of like the grasping at the fog. Hospitality committees are often appointed to fix the problems or improve their hospitality systems. It is one area that churches can address in their goal of growth or to double their attendance and make a difference in the community. Perhaps you were recently recruited to serve on your church’s hospitality committee. Perhaps you were asked to start your church’s hospitality ministry. Perhaps you’ve been asked to train your church hospitality team. Perhaps you’ve been appointed by your pastor to figure out how to warm up your church’s welcome. You don’t need to recreate the wheel. You just need to somewhere to start. You just need a refresher to help you get a great overview of your system and help you find those unnecessary barriers that keep your visitors from returning. I’ve put a resource together for hospitality committees and welcome ministry leaders that want to start looking at their hospitality systems, but are not sure where to start. In 13 short sessions on 3 DVDs, I lead your team through some intentional vision casting and problem solving directions aimed at helping you think through your own setting. 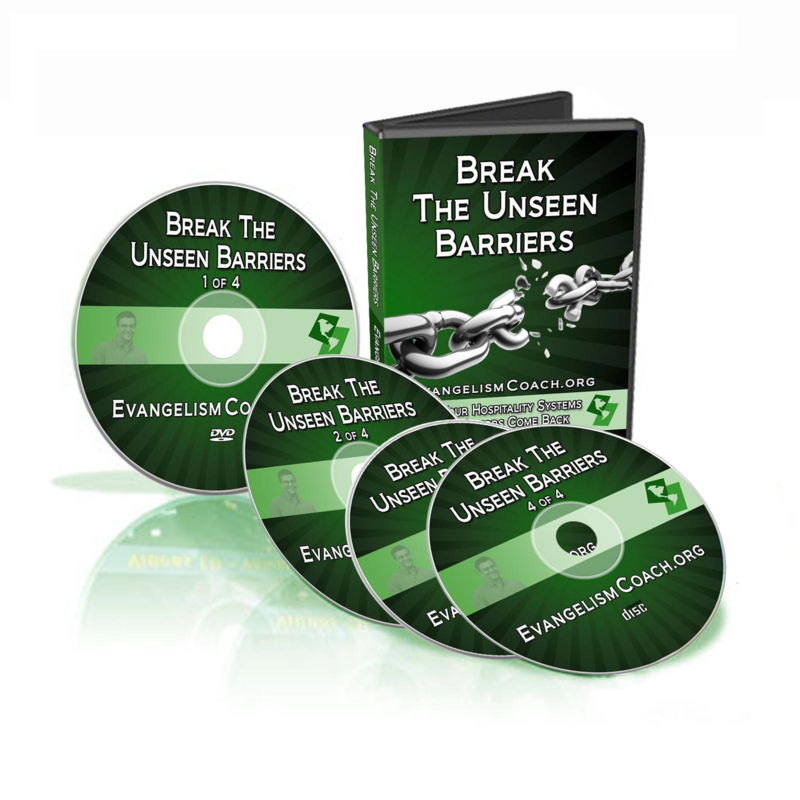 Break the Unseen Barriers was recorded live with an audience from several churches of various sizes that want to improve their hospitality. The discussion questions provoked a lot of thinking and action plans among the attendees who felt re-energized to tackle their hospitality systems. You might be a small church, or even a larger church that has more than 100 volunteers on a Sunday in your greeter ministry. They left the conference with some starting points for action – solving that problem of not knowing where to begin. This has helped jump start conversations among our team. This was well worth the time. It is a 3 DVD set that you can work through together on your own or as a committee. Each DVD contains 5-6 segments, about 10-15 minutes each, together with discussion questions to help you look at your current system of welcoming visitors. A fourth data CD includes handouts, discussion guides, slides, and additional audio on hospitality systems. There are 10 suggested discussion segments for your committee that will lead to next action steps you can implement right away to remove some of the unseen barriers that you identify from your discussion. Do people brag about your church? God brings visitors to your church. Are you a friendly church? The interplay between hospitality and two other systems. Goal: Move from Consumer to Member. One critical question to help you evaluate your hospitality. 2 easy ways to ramp up your friendliness. Four questions to ask that will help you see your barriers. Possible ways to organize your teams. 4 quick fixes to unnecessary barriers you might have. How lots of little things drive your visitors away. How physical facilities shape first impressions and some possible quick fixes. 3 quick tests you can make to double check for a few unnecessary barriers. Quick fixes for under $100 each. How your volunteers make an impression. Quick tips on training volunteers. How to help your volunteers excel in their hospitality ministry. What your new volunteers don’t know and are too nervous to ask. Easy tools to help newcomers personally invite their friends. What to put in your first –time visitor letter that increases your visitor’s desire to get involved. How not to exclude or overlook visitors in your sermons. Quick checklist of your worship experience that might discourage a second visit. How to give visitors the royal treatment when the service is over. How to say good-bye with style. Each of the 13 short segments are under 15 minutes each for manageable use by busy committees. Most end with a discussion starter that will lead to action steps that you can implement right away. 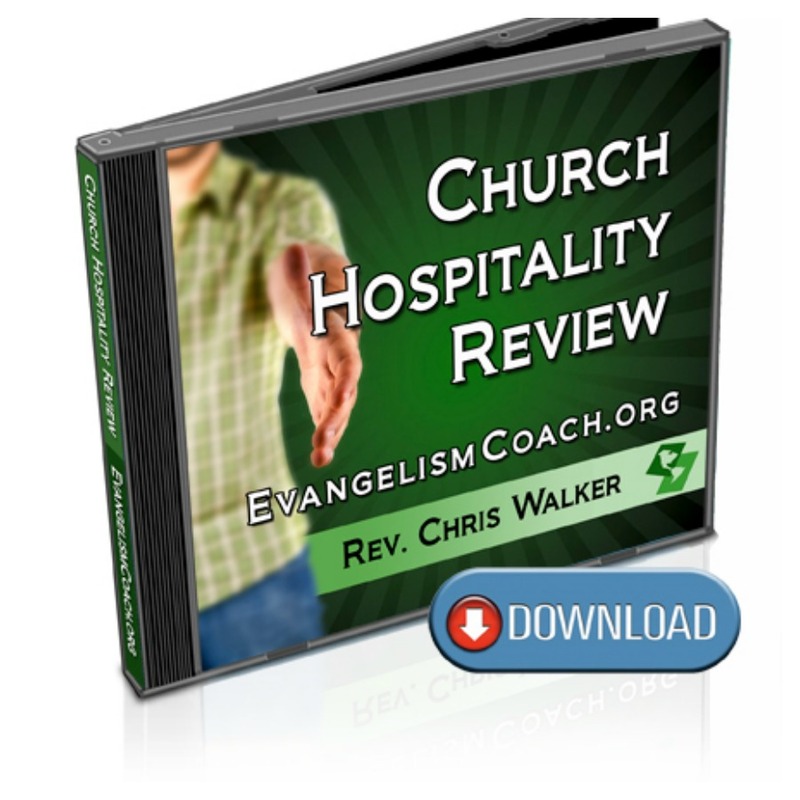 Along with the 3 DVDs, you’ll get a Data CD with presentation slides, support PDFs, and handouts and additional MP3s on hospitality from the EvangelismCoach.org podcast feed. You’ll also receive the mp3 audio only of the videos for use on portable media devices. 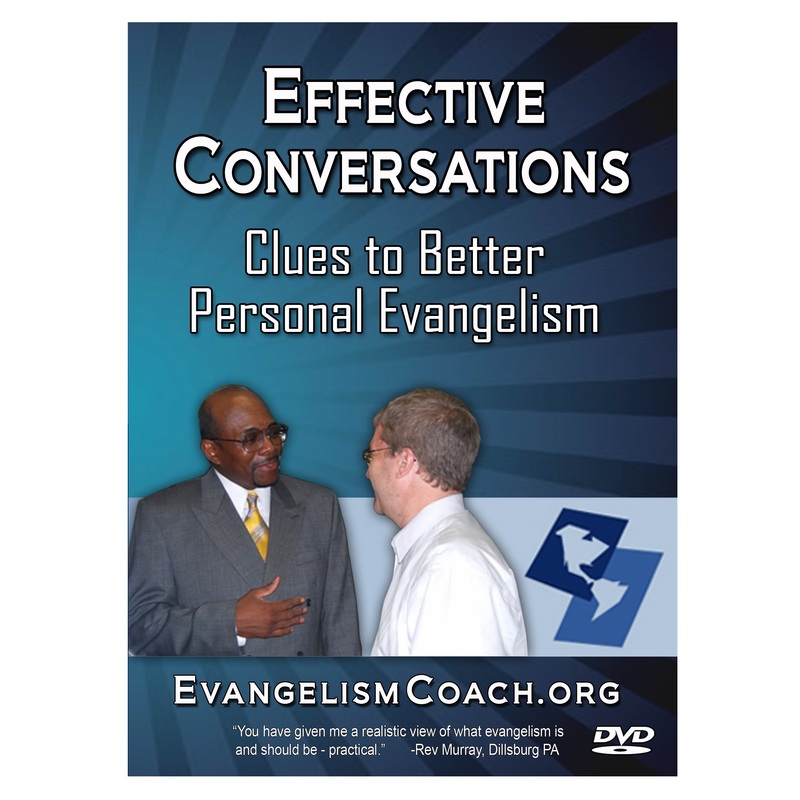 Over the years, I have put together some resources for sale to help your church grow and help you be more effective in personal Evangelism. 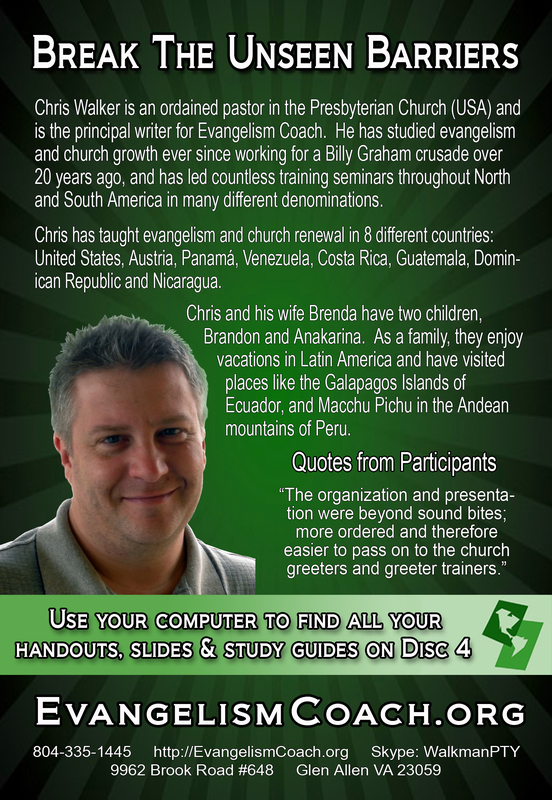 Proceeds support our work of Evangelism Training via the Internet and our Latin American training efforts. Click on a product to learn more.